← 2,000-year-old Israeli date palm trumped by a 32,000-year-old Russian flower? Sometimes it pays to wait before firing off a post. After awhile, something may just come along that turns your story upside down. Or inside out. Such is the case here. Or, some may say the two simply cancel each other out, but I don’t think so: Arrogance and greed versus the demands of Godly justice and the force of simple human decency — in the end, it’s simply no match. The “other” story, which I discovered last, is about some 35 Israeli Jews attempting to plant trees on Palestinian land, with the permission of, and in solidarity and partnership with, the Palestinian owners. This perfectly legal activity ended with … (wait for it) … yes, a nasty encounter with Israeli security forces in full riot gear, who descended on the group, declared the area a “closed military zone” on the spot (a favorite, fall-back gambit of the occupation forces), and then proceeded to arrest some of their do-gooder compatriots (who were later released, after negotiations). Most of the 200 olive saplings were never planted. The solidarity angle issues from the fact that the Palestinians in this particular village of al-Janiya (“Genia” to Israelis) had already lost large portions of their village lands to the neighboring Israeli settlement of Talmon and had come under repeated attacks perpetrated by the settlers involving hate graffiti, punctured tires, broken windshields and other such vandalism. The security forces, who were waiting at the planting site when the activists arrived, considered their action a “disturbance of public order”, meaning that the neighboring settlers would go crazy once they caught wind of it! The story is told HERE, by Rabbis for Human Rights on their web-site, featuring a first-hand account by one of the participants; the coverage includes a photo and two pieces of VIDEO (Note: both videos are in Hebrew. In the 5-minute piece shot on the scene, the only English words uttered provide my title for this story.) The second video begins with a short segment on the incident (as part of a longer Israeli TV program). The title of the story on the RHR site, “Festival of Trees”, is a reference to the minor Jewish holiday of Tu B’shvat, a sort of ‘Jewish Arbor Day’ and the day when the attempted tree planting was carried out. 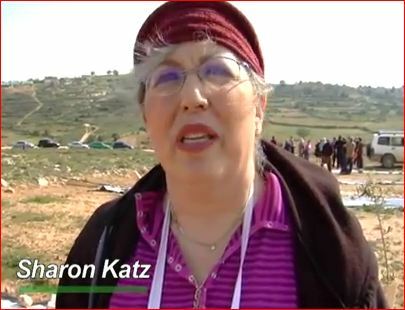 The phrase was uttered by Sharon Katz, participant in an event of the right-wing, settlement-supporting Women in Green organization. It is heard in this 2-1/2 minute VIDEO, posted by the group itself, in an attempt to explain and justify their repeated acts of trespassing upon — and, indeed, trying to lay claim to — privately owned Palestinian land. Actually, Ms. Katz summed up quite well what is going on here, but without identifying who the terrorists are. The settlement-promoting crowd are very clever at wrapping their patently illegal actions in a biblical-prophetic aura and thereby obscuring the legal realities. They can say “black is white” — they can turn principles of Biblical justice, traditional Jewish ethics, and plain human decency inside out, in the service of their nationalist-colonialist agenda — and a few people will always believe them. If you have any doubt how proud the ladies are of their project, they’ll tell you more about it here — and where to send your checks (don’t you dare). 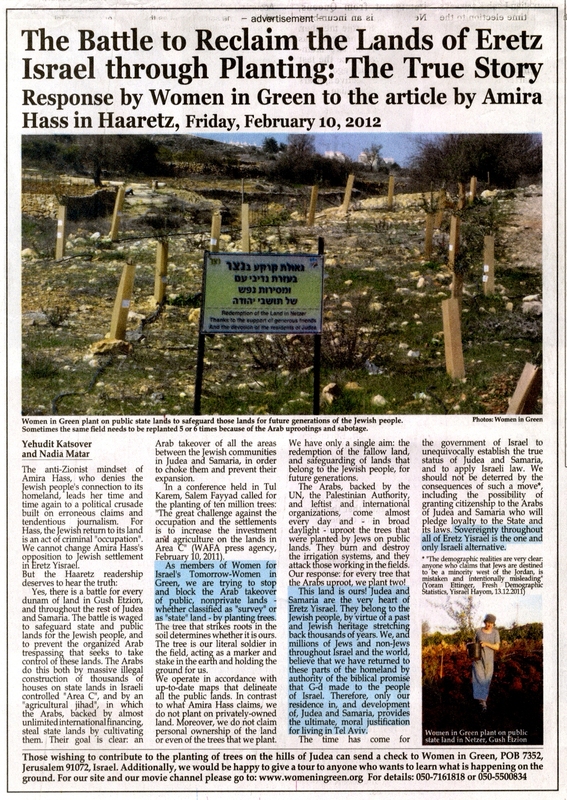 BUT, if you want to know ‘the rest of the story’ — and the impact on the Palestinian families who really do own this land (including repeated acts of settler violence) — it was reported by Haaretz contributor Amira Hass in the February 10, 2012 print edition, found on-line HERE. The text is reproduced in full below. By the way, the article mentions more than once the Palestinians uprooting the planted trees, both the saplings and much bigger ones. The reason is simple and clearly understood by both sides: If the “Jewish” trees remain in the ground and the Palestinians can then be kept off their own land (the Israelis have a bag of assorted bureaucratic-legal tricks they use to achieve this), at some point ownership can actually pass to the “state” (=settlers). So, don’t be scandalized that the Arab landowners are ripping the trees out of the ground. You would too. Sadly, things like this — and obviously much worse — occur on an almost daily basis, and at many places throughout the Israeli-occupied West Bank. The encroachment and covetous land-grabbing is absolutely relentless. The particular incidents highlighted here took place between Bethlehem and Hebron, an area already chock full of Israeli settlements. It’s the very region where the Nassar family has dealt with the same sort of thing for over two decades — forays and incursions onto their private land, the cutting of illegal roads, endless legal proceedings (at great expense) — all of which the Nassars have responded to creatively, with much support, through the Tent of Nations project. Understand, most such incidents are never reported anywhere in the mainstream media, either in Israel or abroad, thus you will only learn about them by trolling the reports or web-sites of various human rights NGOs or UN agencies. Or by reading Haaretz. And where, one might ask, are the supposed forces of law and order in all of this: the Israeli army, the regular (“blue”) police and the (“green”) Border Police? Most often, if they are not actively abetting the settlers, they either conveniently turn a blind eye or harass or, as in this case, even arrest the Palestinian victims of these encroachments. Residents of the village of Al-Khader, imprisoned between the West Bank settlements of Alon Shvut and Elazar, have already stopped counting the number of battles. Every Palestinian landowner has a thick file full of documents attesting that he and his family owned the land many years before Women in Green founder Nadia Matar was born in Antwerp, Belgium. The files also contain copies of their complaints to the police against the settlers trespassing on their land. The weapons in this battle are saplings, irrigation systems and plastic sheeting to keep the water from evaporating. The saplings have been uprooted repeatedly, but Women in Green keep planting them – and full-grown olive trees as well. Once, the Palestinians uprooted those, but the women soon planted six more trees. And then another six [these were certainly stolen from other Palestinian properties — the madness!! (tp)]. On Tu Bishvat – the Jewish Arbor Day, which fell on Tuesday – a man in a mask (“to protect my lungs” ) surveyed the hundreds of saplings planted since October 2010 on land belonging to Yassin Da’dua of Al-Khader and Sauad and Fatma Sanad of Artis. Armed with no visible weapon but a camera, he bestrode the battlefield where Women in Green members say Arabs attacked them in the past. Another bearded man, looking equally unafraid, was replanting uprooted saplings. Women in Green claims the Civil Administration dismantled the outpost they are trying to build there. “Assad” indeed sought to determine where new saplings had been planted, but so far, all his agency has done is issue eviction orders from a few plots it deems “state land.” Despite all the police complaints, the forces of law and order have yet to do anything to stop the takeover of the Da’dua and Sanad families’ lands. On November 5, 2011, Sauad Sanad went with her sister and her sister’s husband to the Kiryat Arba police station to complain that settlers trespassing on their land had beaten them. To their shock, they were arrested on suspicion of having attacked the settlers. They refused to post bail, remained in jail until evening and were released only on condition that they not go near the land for two weeks. When they returned, they found new saplings there. Police also opened an investigation into Da’dua, after settlers trespassing on his land claimed he assaulted them on April 1, 2011. The money buys not only saplings, but also irrigation systems and even wooden benches inscribed with the donor’s name. One such bench is redeeming land that Da’dua, 52, can remember from his childhood: He used to accompany his father to tend the family’s vineyard there. Sauad Sanad says these hills, and the valley between them, are the first sight she ever remembers seeing. Her father, a resident of Artis, bought a plot of land here from an Al-Khader resident in the early 1950s; in the 1980s, before he died, he transferred it to his two daughters. Along with the land, he bequeathed them a one-room stone house he built in 1959. The house still stands, though it is scorched where someone set it on fire several years ago. Between the terraces are some barren, blackened grapevines. “After 15 or 20 years, the vines get tired,” Da’dua explained. He and his family began uprooting them two or three years ago; they then planned to let the land lie fallow for two years, after which they would replant. Instead, it is being “redeemed” by Jews on the pretext that is “uncultivated” and “empty.” In one plot, Sanad said, the settlers even uprooted her grapevines and destroyed the terraces. “Now we’re afraid to uproot the existing vines and continue improving the soil,” Da’dua said. They are also afraid to bring their grandchildren there, due to an incident on January 1: After “Assad” tried to tell three settlers to leave, more settlers arrived, with dogs, and a fight broke out, Da’dua said. Sauad Sanad’s back still hurts; her sister’s wrist was cracked. The dogs attacked the children and tore their clothing. They called the army and the police, who indeed came – and told them this was a closed military zone, so they had to leave. Advert placed in Haaretz, 17 FEB 2012, by Women in Green (highlightling in the original). CLICK for LARGER IMAGE. 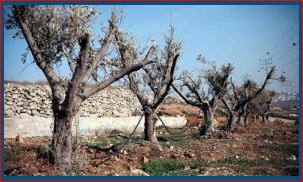 Settlers’ olive trees uprooted by Palestinian landowners, under army protection. 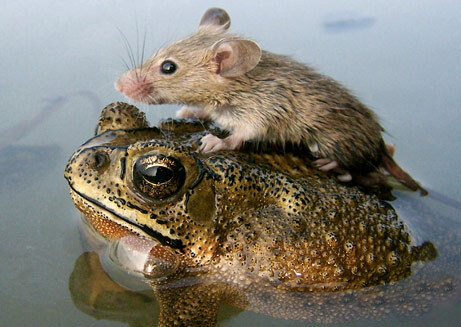 Haaretz photo. ROUND THREE: Now it seems the Israel Defense Forces (IDF), through their “Civil Administration” (occupation government) have done the right thing — for a change — and ordered the Women in Green extremists to end their tree-planting encroachments onto private Palestinian land. The March 19th follow-up story, again by Amira Hass of the Haaretz newspaper, highlights the landowners in this case, sisters Fatma and Suad Sanad, and Suad’s husband Jamal Assad. With their parcel of private land wedged between two Israeli settlements, Alon Shvut and Elazar, they have faced repeated aggressive attempts to relieve them of their property. Now, finally, the state has acted on their behalf. What deserves newspaper space is the fact that the Civil Administration made haste to issue orders demanding the removal of the Jewish encroachment – that is, the trees – on private Palestinian land. This was a new twist: In contrast with countless other instances in which Jews have used the planting of trees as a weapon to seize land that is not theirs, the authorities intervened this time on behalf of the Palestinians – and they acted relatively quickly. This entry was posted in Israel-Palestine Scene, Occupied Territories, Palestinians, Politics, VIDEOS and tagged Amira Hass, Civil Administration, Occupied Territories, Palestine, Rabbis for Human Rights, Settlers & settlements, Sharon Katz, terrorism, Women in Green. Bookmark the permalink. Thank you for speaking truth to power. Ahab’s taking of Naboth’s vineyard is apt. Steve, thanks so much for your comment– I’m glad someone “gets it”!